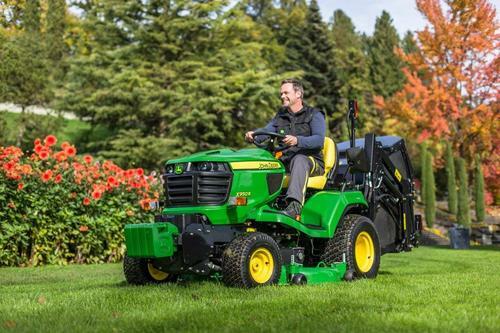 Launched as a result of customer feedback, John Deere’s all-new X950R is the company’s first commercial rear discharge/rear collect diesel lawn tractor, and is being shown for the first time at BTME 2014 in Harrogate this month (main stand no. M58). The 24hp X950R is aimed at professional groundsmen and greenkeepers, landscape contractors, educational and recreational markets, and land management organisations. The basic machine will be available from this spring in four different configurations to suit different customer needs, with a choice of 122 or 137cm (48 or 54in) rotary mower decks and either a 550-litre (low dump) or 670-litre (high dump) materials collection system. The deep design of the high capacity steel decks allows a constant grass flow and easily copes with all mowing conditions, while the collector can be opened in any position, which saves time when discharging collected material. Additional user-friendly features include a unique single multi-function hydraulic lever for operating the mower deck, collector and front mounted implements, and a separate hydraulic pump for lifting and emptying the collector quickly at low engine rpm. Additional features designed for operator comfort include an optional adjustable high-back seat with premium cushioning and an optional arm rest kit. Equipped with a front hitch and pto, the versatile X950R can also be used all year round with a variety of specialist groundscare implements and attachments.